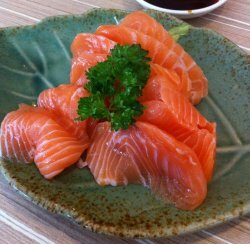 I'm not really a big fan of sashimi as I have had bad experience with bad sashimi which gave me diarrhea. The sashimi served here was thick with bits of fat still attached to the raw salmon. The sashimi tasted fresh to me and texture wise it went down the throat quite smoothly.